This is another good full-court drill that emphasizes transition offense and defense, conditioning, passing and catching on the move, 2-on-1 offense and 1-on-2 defense. We divide the team into two teams, one on each sideline. See diagram A. We start by giving the ball to one team (blue), which starts with two players just inside half-court and one opposing defender (yellow) in the paint. 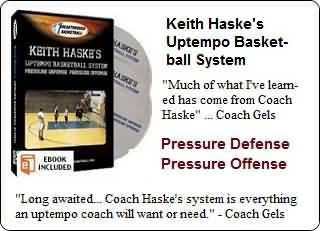 The offensive players will pass back and forth quickly until they reach the 3-point arc and then the player with the ball will attack the defender, with his teammate coming at a 45 degree angle on the opposite side. The offense must read the defender and either attack for a lay-up or the foul, or if the defender comes up, pass to the teammate cutting to the hoop. We have a second defender start on the sideline. Once the ball is beyond half-court he/she sprints out, touches the middle of the court, and sprints back to help the lone defender. The offense must attack quickly before that defender evens the odds at 2-on-2. The lone defender must try to delay or stop the offense. If the offense scores or gets fouled, they get one point. After a made basket, or if the offense turns the ball over, or misses the shot and the defenders get the rebound, the defenders are now on offense (diagram B) and speed-dribble and pass back and forth up the floor and attack the defender on the opposite end. And so it goes, back and forth up the court, non-stop. Each team keeps track of their score. We usually play to 10 or 12 (depending on how much time we have)... losers run. After the two offensive players (blue) either score or lose the ball, they both go off to the back of their team's line on the sideline (diagram C). While play is going on at the opposite end, the last player in yellow's line will go back and get ready to become the next solo defender. The first person in the yellow line will be the trailing defender sprinting out from half-court. is a good move for attacking in this situation. We certainly do not want the player with the ball to cross-over as this brings him/her right into his own teammate... we want to keep the balance on both sides.